How bad was L.A.'s smog when Barack Obama went to college here? President Obama attended Occidental College in Los Angeles from 1979 to 1981. His memories are full of smog. So how bad was it? According to historic ozone data collected by the South Coast Air Quality Management District, it was pretty bad. In 1979, the air quality failed to meet modern standards for 234 days of the year. In 1980, it was 210 days. And in 1981? 227. Smog was such a big issue, the Los Angeles Times even had a dedicated beat. Here's a look at some of that coverage. "Eye-searing, throat-burning smog smothered the Los Angeles area in a bourbon-colored blanket," The Times' front page said Sept. 14, 1979, as Obama was starting his first year at Occidental. The air quality particularly harmed people with diseases such as asthma and emphysema, sending scores of them to hospitals, but they were far from the only ones affected. Schools kept children from going outside, and "doctors advised even healthy adults to stay indoors," the paper reported. A few months earlier -- on June 28, 1979, -- a front-page Times article proclaiming "Southland Under Smog Alert" described how predictions of a Stage 2 alert kicked emergency plans into action. Companies with more than 100 employees in one location had to slash employee driving by as much as 75%, requiring them to carpool or use public transit. "Many firms have plans to cordon off parking lots, allowing only cars with three or more passengers to park," the article said. Under the plans, companies emitting air pollutants had to cut emissions 20%, and if possible, utilities were required to burn natural gas instead of fuels that produce more pollutants. If a Stage 3 alert had been predicted, the article said, "all commercial and industrial establishments would have been required to close down, as on a national holiday, and all motorists would have been requested to leave the highways." Despite such measures, dangerous levels of smog did not vanish quickly. 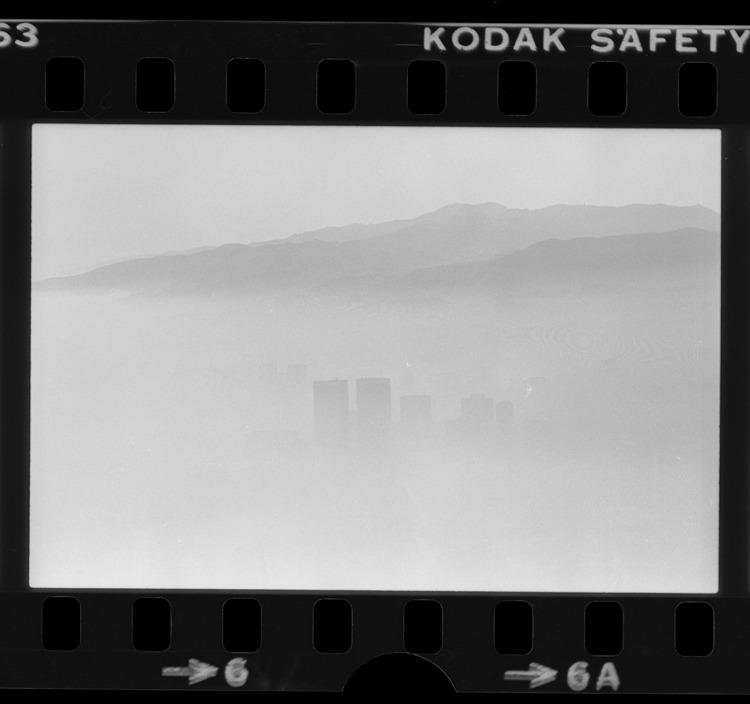 On June 27, 1980, for example, smog alerts peppered the Southland. The most severe alert -- a Stage 2 -- was in the east San Fernando Valley, The Times reported the next day, and the other 15 alerts affected wide swaths of the Los Angeles area and Inland Empire. The article passed along advice from the South Coast Air Quality Management District: "Stay inside, don't move around too much and drive as little as possible." Here's another look at the smog. This photo was taken Oct. 1, 1980, on Los Angeles' Westside. "The towers of Century City peek through the murk at 4:15 p.m. Wednesday in an air view looking to the northwest," read the caption in the next day's issue of The Times. In 1981, Obama transferred to Columbia University. 7:21 p.m. Aug. 3: An earlier version of this post said Obama transferred to Harvard University in 1981. He transferred to Columbia University. Air quality in the Los Angeles area has improved dramatically since the 1970s and '80s. During Obama's time at Occidental, ozone concentration violated modern standards on most days. In 2013, the most recent year for which figures are available, it was down to 90 days. There have been no Stage 1 smog alerts since 2003 and no Stage 2 alerts since 1988, according to the South Coast Air Quality Management District. The last Stage 3 alert was in 1974. L.A.'s air is still not crystal clear. But if Obama attended Occidental today, he'd have an easier time going on a run.